Oh yeah, I’m sure you know who this guy is. 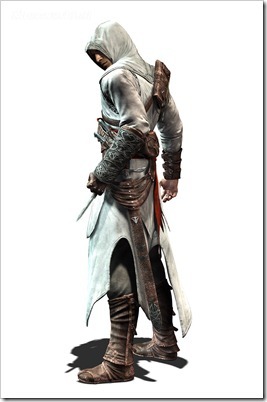 His name is Altair from Assassin’s Creed. Cataclysm isn’t even close yet and already I’m day dreaming about my tier gear. Anyway, this idea came from leveling throughout Uldum. I was inspired by the deserts and the Egyptian themes. I’m hiding my helm if we’re getting a turban though. Do you know how long I wore my Spellweaver’s Turban for back during Vanilla? Too long! What do you want your tier 11 to look like? There are now two Mimetirs. She’s now also a male Tauren warrior on Argent Dawn (EU). This might sound like a bit of a break with the beaky tradition but it’s not too much of a stretch for a character who’s named for her ability to mimic other creatures. Being a warrior still makes her a birdbrain, after all,. Why am I telling you this? I thought I’d share a happy occurrence with you. On Tuesday I heard (thanks Jaedia!) about Single Abstract Noun (SAN). It’s a community guild on Argent Dawn (horde side for EU, alliance side for US) open to anyone in the WoW blogging community, be ye a reader or blogger. So, I’d like to thank Tamarind, Miss Medicina and crew for having the idea and setting it up – great thought, guys. I think the full story of how it came about – and the guild policies – are here (EU) and here (US). The guild roster is already astonishingly long and guild chat on Tuesday was moving so fast it was almost impossible to keep up with, which was good to see. Not only that, it was lovely to see a whole load of warm welcomes when new folks signed up. So, if you’re in any way related to the blogging community – and if you’re reading this, you are – I think I’m right in saying that you’re welcome to roll an alt and join up, See moo there! meet my shaman, Ape. He quakes in his boots when he visits the badge vendors at the moment. At this rate he’s going to give all his frosties to the bartender at the Legerdemain in return for calming, calming wine. In the name of fun – and of my shaman’s sobriety – I’ve decided to put his dilemma to a vote with you guys. You know how it is when you’re browsing the vendors in real life. You’ve tried various shinies on by this point. The blue top is only worth it if you get the new jeans as well. The stripey top only really works with some outfits. And the wristlet – well, it’s small and will put an inappropriately sized crater in your purse but then it is really shiny. It’s easy to get in a tizwaz about upgrades to your wardrobe. Particularly if those upgrades have stats on them and it’s not just the colours that you’re trying to match to the rest of your outfit. I’ve seen and heard a lot of discussion about the various tier 10 set bonuses, and the sets themselves. I’m not going to ramble on about them here except to say the 2 piece tier 10 resto shaman bonus is nigh essential. At the moment I’m torn between three new additions to my outfit for different reasons. I have 78 frosties saved up. I bite the bullet and buy the Purified Lunar Dust. Happily, it’ll solve the trinket issue. On the other hand Murphy’s Law says I’ll then get Althor’s Abacus and/or Solace of the Fallen quicksmart thereafter. I buy the shoulders now even though they’re a next-to-nothing practical upgrade. Why? Because I’ve heard about the shoulder-shoveltusk animation and I think it sounds really quite fun. I know, I know, small things. The catch here is then deciding which of the other options to pursue after the shoulders have made my day. As a fourth, ugly-duckling type option I could say dash it all, and go for the somewhat-shiny but not-critical-upgrade Waistband of Despair. So what do you think – what should I go for? Cast your votes now! Feel free to either just post a vote or go as in depth as you like. Either vote here in the comments page or tweet @Juddr, voting closes on Monday or so. The other week, as a gift to you from us, we each offered to write and discuss a topic of your choice. Here’s what we came up with! What do you want for Winter Veil? You want to wrap your boomkin snugly in an Ancient Polar Bear Hide or keep your holydin’s toes toasty in a pair of Mudslide Boots? Well you can’t have it. Patch 3.3 has hit just in time for the winter holidays – a time when a lot of us players manage to squeeze in extra time being a hero and getting shiny treasures. 3.3 brought a sled-load of new toys to play with in game, including the new dungeon finder system and its potential for random group member loot drama. As a result while using the dungeon finder we are all limited to needing only on items of our class’ armour type. You’re a paladin? You roll on plate. Plate, y’hear, no cloth for your healing set. Certainly no leather for you DPS warrior types! It’s not exactly ideal for anyone gearing up. It’s the Winter Veil equivalent of a pair of socks: practical, but not exactly what you wanted. I can see the practical sense in this. It removes some arguments about loot before they’ve even begun. The rogue won’t get miffed at the shaman needing on and winning leather melee gear because the shaman just can’t. Likewise, the death knight who is prone to shiny object moments and rolls on spell power items accidentally – just can’t, and won’t have to explain himself to pitchfork wielding casters. Reducing the potential for arguments is a sensible, if slightly cynical, move in a system which promotes meeting random strangers who have no reason to relate to or sympathise with you. Yet what does that do to your characters? It might be taboo but we all know that paladins do incorporate all types of armour into a healing set, have done since the beginning of the World … of Warcraft. A paladin friend of mine has recently started gearing up for his holy off spec. He would prefer plate items of course, but any type of item with spell power on it is better than healing with defence rating gear. We had the Azure Cloth Bindings drop for us just earlier today – and he couldn’t roll on them. Sure, he’d only have used them as a stop gap until something better and more, well, platey came along. But until then they would have seriously boosted his off spec prospects and none of the actual clothies in the group showed the slightest interest in wanting them anyway. The only option for my friend, or anyone looking to boost their off spec with drops forbidden by the loot system, is to greed the item and hope that RNG is kind to them and doesn’t shard it for someone else. Or of course to keep running Heroics, waving sadly at these drops, and waiting until they’ve enough badges to get the badge equivalents. Take another situation. You’re a tree who is so bored you’ve taken root in the middle of Dalaran and didn’t bat a branch when children – sorry, gnomes – covered you in tinsel and shiny lights two weeks ago. You want to do something different. Something fun. You’ve had the cookie-cutter spec for a while, got the gear, done everything you want to do. So you start playing around building your own spec – something hybrid that allows you to heal and CC or DPS without changing spec. Yes, healing and DPS – you know it happens, especially when people are bored. And Heroics aren’t exhilarating, let’s face it. 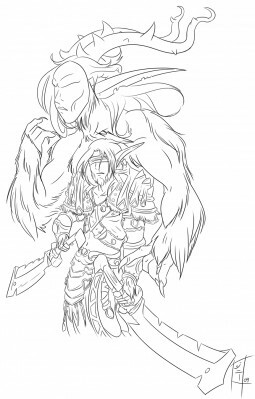 Say you want your druid to be able to do all that in one spec – well then, you’ll need to play around a bit with your stat distribution and probably get some new armour. Would you like some hit with that? How about a new party hat – the cloth Sightless Crown of Ulmaas would do the job. Oh wait – you’re a druid – you can’t roll on cloth, even if the rest of the party consists of three death knights and a warrior. There are still a couple of loopholes, too. To my knowledge death knights and druids are able to roll on loot with block rating on it. 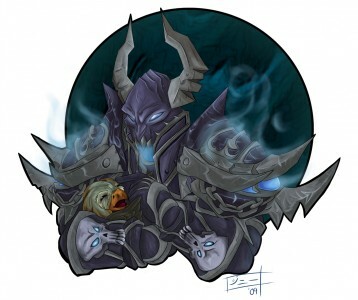 A pointless stat to them, but perhaps your death knight tank decides that he is so desperate for something to upgrade from his blue helm that when Second Helm of the Executioner drops it is a must have even though the itemization is aimed more at the group’s paladin who is only tank as off spec. 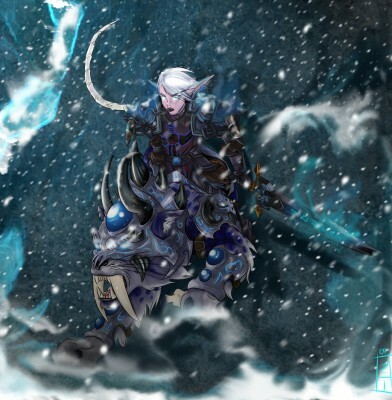 Well, gratz to the death knight for the upgrade – but it’s only a minor victory for him, and leaves both him and the paladin a bit cold. Should Blizzard further tinker with the need before greed system? Perhaps add class specific tooltips – “classes: paladin, warrior” – to the aforementioned Executioner’s helm. Similarly for every item, and a filter that only allows the specified classes to roll on items with stats meant for them. If this came into play then it would likely automatically further restrict itemization choices for players. Every rogue of the same playing level would look the same. 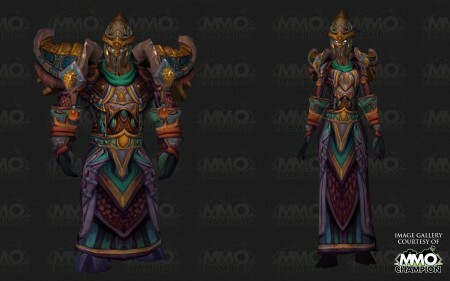 Every healing priest would be in the same dress, every restoration shaman would have identical mail shoulders for restoration shamans. That Winter Veil tree druid in Dalaran would have even less freedom to play around with his spec and try new things. But at the same time – everyone would get loot cookie cuttered to cater the ‘correct’ stats to their spec. Say that our off spec tank paladin from earlier wants the correct stats – for his protection off spec – and rolls need on the Executioner’s helm against the death knight tank. Whatever his reason, I’d bet the death knight isn’t impressed with him rolling for his off spec. Would you be, if someone else rolled against your main spec items? We’ve all seen it. Perhaps the need before greed system should take specs into account. A priest is healing in a random dungeon? Right, says the loot system. He can’t roll on items with hit on them like Bracer of Worn Molars, under any circumstances. On the up side he won’t be able to ninja, on the down side he won’t be able to prove he’s trustworthy or improve his shadow kit if everyone else passes on the toothy armguards there. These are ridiculous ideas, I hear you cry. They’ll never happen! Maybe you’re right, or maybe they’ll happen at some point. I’m just saying that the need before greed system is already restrictive – unnecessarily so, perhaps. I for one am perfectly happy with a holydin rolling on cloth items so long as no clothies need the item, and so preventing holydins from doing it seems a potential waste of an item. It may be a slippery slope we find ourselves on in the name of wrapping classes up in their own specialised cotton wool. What do you think? Is the need before greed system protecting us just the right amount in random dungeons at the moment – should it be more or less protective? Are you getting infuriated trying to gear up your new fury warrior? Is all this an argument to make a premade group so there aren’t limitations on loot? Back in the Vanilla we received not one, not two, but three items of legendary status. Crafting these items was arduous and rewarding to complete. They were very lore centric and having one was a big deal Lets look at the first three Legendary items. The baby legendary of the initial bunch, this was crafted by combining a Sulfuron Hammer with the Eye of Ragnaros. The part list for the initial hammer was pretty steep I mean take a look at it here. The Ingot’s only dropped from Golemagg in molten core and 50 arcanite bars was one hell of a tall order. 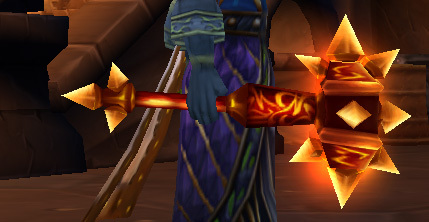 But when you finally got the hammer made and then finally got Ragnaros to drop his eye, you had at the time THE best two hand dps weapon in the game and an item tied to the elemental lords of Azeroth’s birth, and it looked cool too! In order to craft an elementium bar you needed to gather 1 [Elementium Ore] (from Blackwing Lair), 1 [Fiery Core], 10 [Arcanite Bar], and 3 [Elemental Flux]. When you finally got the pieces together you had to talk to Demitrian who summons the remaining essence of lord Thunderaan. An outdoor RAID boss fight in silithus later and you get your sword. This item was the best tanking weapon even up through The Burning Crusade. It’s proc alone making it invaluable to raids. Having one was truly amazing, difficult to get and offered a large benefit to any raid group that had one. If you had one you were pretty well set. If you’re looking for a lore weapon steeped in Azerothian history this staff delivers and in spades. When Naxxramas was released we got a chance to begin building the staff of the Guardian’s of Tristfall and ultimately Medivh himself. The staff was protected by the Kirin Tor after Medivh was assasinated and then was destroyed when Archimonde blew up Dalaran. The staff was shattered into Forty Two (42) pieces that were scattered to the far corners of Azeroth. Brann Bronzebeard himself held the base piece until he lost it to C’thun in AQ40. Kel’thuzad wanted the powerful focus for himself and when Naxx came to Azeroth the scourge began gathering pieces, eventually obtaining the head piece and the 40 shards of the shaft itself. Players could gather the shards for the frame from bosses in Naxx and the Head from Kel’thuzad himself. The base could be obtained by defeating C’thun in AQ. When all the pieces were assembled you could obtain one of four flavors of the staff. Priest, Druid, Lock and Mage were all able to wield a version of it with stats custom tailored for the PC. The staff also gave players the ability to teleport their entire group to Karazhan, the home of medivh himself. Having one of these was truly epic and not many people managed to compelte it. It is a very lore centric item to the world of warcraft and if you had one, truly it was awe inspiring. From here lets take a quick jaunt to The Burning Crusade. In BC endgame, technically three legendary items were introduced outside of the Kael’thas encounter. I wont spend too much time here because honestly while they are legendary quality, I felt truly let down by the items themselves. These items are the weapons of Illidan himself. Illidan obtained these weapons by slaying the doomguard commander Azzinoth nearly 10,000 years prior. 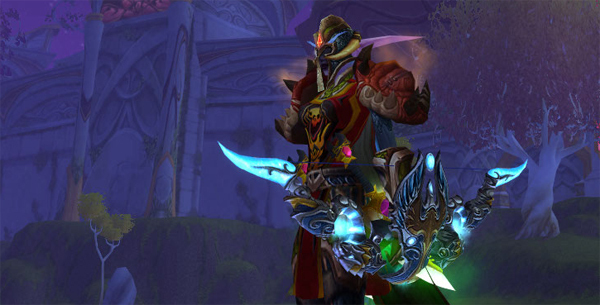 They became the symbol of his office so to speak and all demon hunters since have wielded dual glaives such as these. These items were drops from Illidan himself, there was no quest to obtain them. While getting them was still an amazing task after having to defeat all of Black Temple and it’s challenges to even have a chance to obtain them, it didn’t quite have the feel of obtaining any of the previous three. I know someone who had obtained a Thunderfury after much hard work and then had received a set of blades and he said that it just didn’t feel like it had the same weight. While they are very lore centric, and they are wickedly cool. I think there should have been a bit more questing to get them. But that’s just one shaman’s opinion. Every hunter I know wanted this item. It was THE best dps bow in the game, and until recently held that same title. It drops from Kil’jaden in Sunwell Plateau and it generates it’s own magical arrows. Before the removal of the need for quivers and ammo pouches this was HUGE. Research doesn’t show a tie to any lore specific character for this item and honestly there’s not a lot of info on it other then it’s awesome stats. It is speculated that it is a manifestation of the sunwell’s power because of it’s ability to create magical burning arrows, but blizzard has never released any official lore about the item itself. From there we move on to the absolute return of the TRULY legendary items. In Wrath of The Lich King these items are lore centric and as we can see the reward for the time put into obtaining them is there. This item is obtained by defeating bosses in the instance of Ulduar 25. You obtain 30 [Fragment of Val’anyr], and then fuse them together into the shattered fragments. The quest leads you to a computer console of the titans that explains the history of the mace and how to reforge it. Let me share with you the history of this item. Created by the Titans themselves, Val’anyr was given to the first Earthen king, Urel Stoneheart. With it, he was to create and give life to the rest of his brethren. Urel Stoneheart used Val’anyr during the first war between the Earthen and the Iron Dwarves. The weapon was shattered and its remnants were believed lost in the conflict. So here you have an item gifted by the titans, the shapers of all life on Azeroth even the Dragon Flights themselves, given to the First Earthen king, and well honestly the first earthen. They GAVE him the power to create life. This item is an old item of power and is tied intricately with the creation of the Dwarves. Having one means you’ve collected the fragments, defeated Yogg on hard mode and have put the time into getting the item. It just feel awesome to hold something with such heavy lore weight and think “wow, this item created an entire race. And here I’ve only unlocked a small portion of it!” Having one truly you can feel the reward for the work put in and it feels truly legendary. Only with these mighty components, it is said, can Shadowmourne be finished. And, yet, even if the axe could be completed, questions and fears remain. Is forging the souls of the deceased into a weapon treated with blood and the essence of the Twisting Nether truly any different from the crafting of the Scourge’s runeblades? And who will be bold enough to try to wield such a weapon? Might Shadowmourne bring the same doom and misery to the living as its sister blade did? Um… yes pls. so far in order to obtain the item of such legendary proportions there is a long quest line in place. the quests, as far as is known is as such. This ranges from obtaining Artha’s mace, to killing specific NPC’s and bathing the blade in their blood up to defeating the Lich King himself. It is an outstanding amount of work to obtain and from what we can see, it’s well worth it. Obtaining one of these will be hard work, but in the end the return for the time invested will be amazing. And just fitting with the epicness of the weapons we received a plethora of sound files with the new voice of Arthas. Does this mean that Arthas’ soul will be the final one to occupy the blade? It is at this time unknown, but I for one look forward to finding out. In case you missed it here’s a short video of the weapon. BC didn’t feel like obtaining the legendary items was very significant in the world, no where near as much as Vanilla WoW’s items did. In Wrath though it feels like obtaining the items has weight in the story, and truly feels awesome to hold. Now there are non legendary quality items that have this feel to them, that truly feel epic and story impacting, but that my friends is a post for another time. What do you think of the legendary items? Do you think the way they are obtained now is good or bad? Do you like the lore of the items? So where has Lodur been you might be asking? Well I’ve been a busy Shaman. For those of you who may not know I am now the co-host of a weekly podcast called For The Lore. We transmit every week live on Monday’s at 6:45pm EST over at our Ustream Channel. We cover all aspects of modern gaming and some of the old school, we talk about more then just the lore of these games but the story is honestly a big part of why we play these games. Needless to say I’ve been quite busy with that and keeping the ball rolling over there. If you have time feel free to check us out live Monday evening’s or download us for free through iTunes and listen to your friendly neighborhood Shaman speak his mind. Now while I have been busy with that among several other projects, I have not been living under a rock. I did see the Shaman tier 10 models and I dare say that Blizzard put it up rather shortly after my Cardboard Samurai post because I think they realized the natives were restless 😉 Lets take a look at it in it’s full glory shall we? 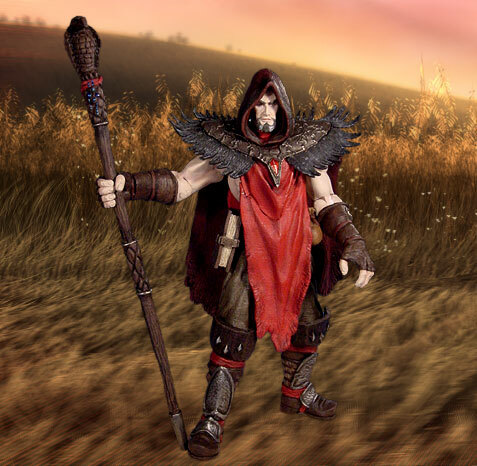 Aside from the kilt, this set is identical to the hunters tier 9. It didn’t look very shamanistic, and to be honest it was pretty ugly. I wish I could hide my t9 or have a vanity set shown over it because it’s not that great. 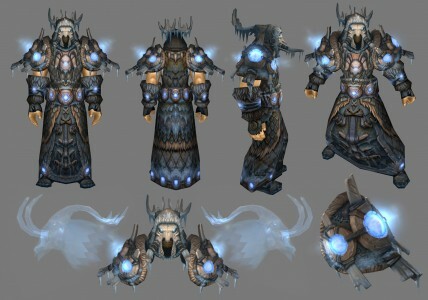 Tier 10 feels very shamanistic, lets not forget that Ner’zhul was a shaman before he became the lich king, so the tier 10 armor has this erie shamanistic feel to it. It has the icicles around it randomly for the elemental feel of water, and the bones are that of what appears to be a Shoveltusk. Stags, Talbuk and Shoveltusk have always been representations for the Spirit of the hunt or spirit of the wild for shaman, so it seems only fitting to have not only their bones but the spirtual image of them pushing outwards from the shoulders. I’m impressed and honestly very very happy with it. I think this was blizzards way of saying “we’re sorry for tier 9 guys, here… look awesome” and I say to them. Thank you. I’m quite pleased with how tier 10 came out. What about you guys? 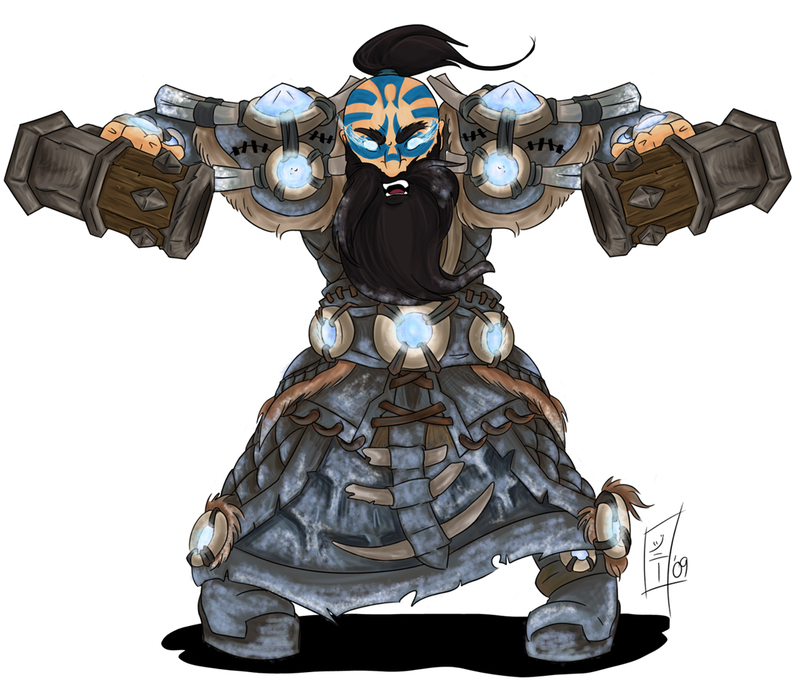 What do you think about the Shaman tier 10? Think it looks good, bad, meh? Have you seen this mace? It’s supposed to drop from Rotface, I believe. Have you looked at the proc yet? Make sure you read it twice. Each time your spells heal a target you have a chance to cause the target of your heal to heal themselves and friends within 10 yards for 217 each second for 6 seconds. I’m assuming there’s a 45 second internal cooldown. This mace could come in handy for any class, I’d imagine. Judgment of Light? Chain Heal? Circle of Healing? Wild Growth? You’ll be hardpressed to make the argument for why this mace is hands down better for one class over another. I know there’s one person in my guild who won’t be getting it. I’ve already got my legendary. I’m assuming Val’anyr won’t get buffed to bring it in line with 3.3 weapons. Loot Council’s going to have a difficult time with this one (or easy, since it’ll be effective in the hands of any of our healers anyway). It’s My Party and I’ll Spec How I Want To! You’re the one who sits in front of your computer. You’re the one who has to look at the back of your toon’s head all night (or day). You’re the one who has to put the gold into gems, enchants, and glyphs. You’re the one doing the necessary rep grinds. Most importantly, you’re the one paying $15 each month to play the game you enjoy. Hence, you’re entitled to play how you want to play, right? Keep in mind that it doesn’t mean people are always going to want to play alongside you. 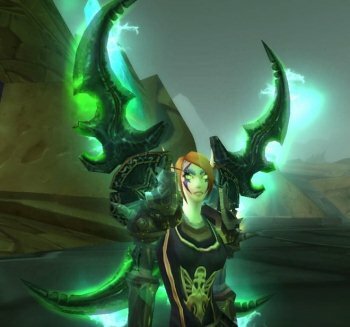 If you’re a chain-pulling DPS Death Knight, it might be tough for you to find dungeon groups. If you’re a mage who is trying to mass-bandage people in battlegrounds instead of DPS, expect to get laughed at. 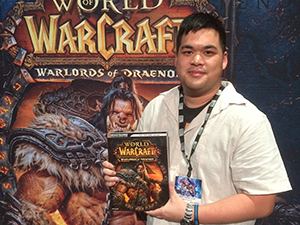 Most of us strive to play our characters in a way that helps and benefits a raid, battleground, or arena team. We’re going to look at things from a raiding perspective. …the practice of playing a role-playing game, wargame or video game with the intent of creating the “best” character by means of minimizing undesired or unimportant traits and maximizing desired ones. Obviously, this doesn’t only have to do with spec, but also relates to gear, gems, enchants, and spell/skill rotation. How beneficial is it to tweak all of these to get the most desired output from your character, whether it be healing, DPSing, tanking, etc? If you really want to be effective in a raiding environment, leave your PvP spec, or your “hybrid” spec at the door. Although it is perfectly viable to heal in a PvP spec (I usually do it after Wintergrasp), you’re lacking in true PvE potential if you’re not specced properly for raiding. Taking talents such as Improved Ghost Wolf or Reflective Shield are not effective for raiding in the slightest. The points you spend in talents like those are much more useful in talents that boost your raiding skills/spells. Granted, you may be able to find yourself in a guild that doesn’t mind you being a hybrid spec. Perfectly fine. Just don’t be too upset if your raid spot is handed over to someone with a pure spec. Keep in mind that the effort you don’t put into raiding has to be made up by the other raiders. In effect, you run the risk of making their job harder. It can be handled for a while, but there’s an often-reached breaking point. The term “cookie cutter” usually refers to a globally accepted spec to accomplish a certain job. PlusHeal.com, TankSpot.com, OutDPS.com, and WoWWiki.com are all great places to get yourself a “cookie cutter” spec for whatever role you’re filling. I usually reserve using a spec like those for when I’m first learning a new playstyle. As a Discipline Priest, I’m not too familiar with Holy. I lined myself up a “cookie cutter raid healing” spec, and learned the mechanics of that style that way. The more I get comfortable with the abilities, buffs, debuffs, etc., the more I can tweak the spec to what I need, as well as what the raid needs. If you’re joining up with a raiding guild that’s new to you, take a look at what kind of role you’re going to be filling. If it’s foreign to you, start with a “cookie cutter” and go from there. Each method serves a purpose. Whichever path you choose, you essentially keep the minimum amount of everything else to function as a healer, and maximize what your goal is. If you lose your ability to keep a target up or sustain mana in a fight, you’ve “min’d” too much. If you min/max correctly for the role you’re filling, then you’re incredibly good at your job. If you’re a tank-healing Discipline Priest in consistently short fights, and you gem into a higher Critical Strike Rating, then Inspiration and Divine Aegis are gonna stay up on the tank most of the time, making the other jobs easier. If you’re a Resto Shaman healing the raid with a lot of AoE damage, and you gem for Haste, then you’ll be firing Chain Heals off like mad. It also makes it easy to judge your gear upgrades. You know what you’re aiming for, and you know what stats you don’t really need to focus on. In fact, you may have some stats you may be able to start scaling back on to accomplish your goal. You go too far, and you lose versatility. If you’re gemmed out for big heals, but don’t have longevity, you’ll be tapping out quickly. If you’re stacking mana, but don’t have a lot of spellpower to back it up, you’re going to have a tough time lending a hand in short fights that pack a lot of punch. A lot of us know the value of being able to think on your feet. A good raider needs to be able to pick up the slack when someone goes down. If you’re a one-note player, you’re going to have a tough time switching around. A raid leader needs to fill specific roles in a raid, but he/she also needs people that can adapt if circumstances change. Staying within the role of your spec, do what you can to make yourself a well-rounded player. As a Discipline Priest, my primary role is to keep the tanks alive. However, if my target isn’t taking any damage, I’ll throw some HoTs and Flash Heals on the raid to help everyone else out. 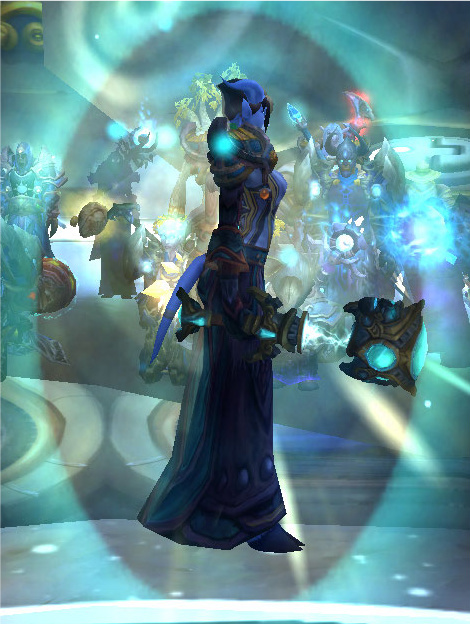 It would be unwise of me to try to work my spec and gear to be a full-blown raid healer. It’s a waste of my talents and spells, but that doesn’t mean I can’t help out when needed. What do I do? I hit a point where I got comfortable with my mana pool and regen. I could easily get through longer fights with my mana cooldowns (and keeping up my end of the healing). I started swapping out my Brilliant King’s Amber gems for Luminous Ametrine gems. This lets me keep my mana efficiency while upping the power of my heals. If you need something more specialized for a long fight or for nuke heals, start building an alternate set of gear that’s more gemmed/enchanted for the task. With all of the options for getting gear out there, it shouldn’t take that long to build a “special set”. It’s an easy way to avoid being a one-trick pony. Remember: Raiding is a team effort. You have to put a lot into it if you want to get a lot out of it. Cutting corners with spec/gear, or maxing TOO much of a certain stat can runs the risk of putting you on the standby list real fast.